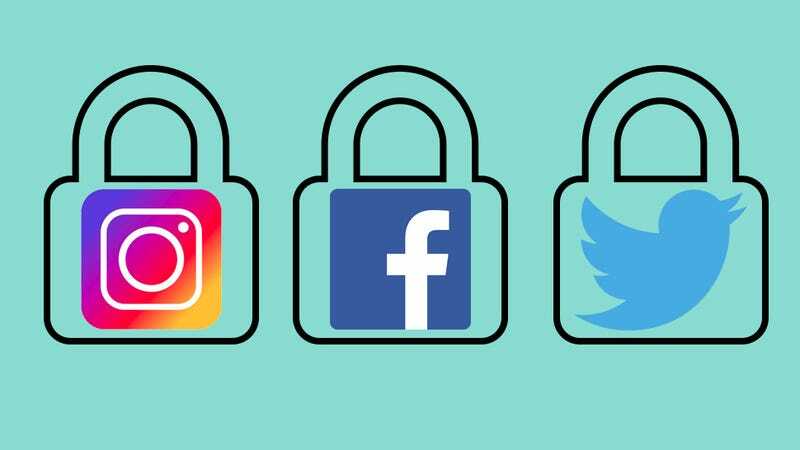 Maintaining social media accounts while staying as anonymous as possible isn’t easy—just ask the Director of the FBI—but you can put your Facebook, Twitter, Instagram, and other accounts into a locked-down, private mode to evade detection. When your social media accounts are locked down people can’t see what’s inside without your permission. This is great if you want to stay up to date with close friends and family, but aren’t keen having random internet users wandering across your profile. If you’re hunting for a job and don’t want potential employers scouring your Facebook or Instagram for ill-advised photo, or you’re a teacher and don’t want your students browsing your Tweets then here’s how to lock things down. Facebook is the trickiest social network of the bunch when it comes to trying to stay private, but you do have options for keeping your posts hidden from the outside world, (though not from Facebook’s advertising algorithms). Underneath every status you update and every photo you upload is what’s known as the audience selector menu—options here range from Public (even people without a Facebook account can see it) to Only Me. You probably want something in the middle, and Facebook lets you create custom friend lists so only certain people can see your posts. Once you’ve chosen a setting in the audience selector tool, it stays applied for all your posts until you change it again, so double-check before posting. And if you want to know who can see what on your profile, click the three dots on your cover photo, then choose View As from the list. Facebook lets people who aren’t your friends follow your public posts, Twitter-style. To make sure this option isn’t available on your account, go to the Public posts page and check the setting in the top-right corner—it should be set to Friends if you want your profile page and your posts to be as well-hidden as possible. If you delve into the Privacy tab of Facebook’s Settings page, you can hide your profile from showing up to search engines. On the same screen, it’s possible to limit who can find you by email address and phone number. Meanwhile, if you go to the Timeline and Tagging screen, you can take some control over what other people post about you on Facebook—tags can be reviewed before being applied, and you can limit the audience for posts other people make to your profile. You can’t set your Facebook profile to be fully private, as you can on Twitter and Instagram, but you get more granular control over who can see each post—so some of your stuff can stay locked away and some of it can reach a wider audience. Twitter and Instagram take a very similar approach to privacy: your profile can be either public (anyone can see posts, whether or not they’re friends with you) or private (only approved friends can see what you’re posting). Staying public certainly has its benefits, but as you’re reading this we’re assuming you want to keep your profile hidden. On Twitter, open up the Settings and privacy screen from the menu under your avatar, then click Privacy and safety and tick the box marked Protect my Tweets. On the same screen you can prevent other people from finding you based on an email address or phone number, which certainly helps if you don’t particularly want to be found. Go private on Twitter, and all your past and future tweets are hidden from view to everyone except people you’ve approved as followers. Everyone who was already following you is automatically approved, but you’ll get a prompt for new followers. The option to retweet your tweets will be disabled, though any of your approved followers can take a screenshot of something you’ve said, so choose your friends wisely. As far as Instagram goes, you can make the change inside the app. From your profile screen, tap the settings menu button (it’s a cog icon on iOS and three dots on Android), then toggle the switch marked Private Account to On. All of your past and future posts are then visible only to approved followers, and as on Twitter, everyone who was following you already automatically gets in the club. Your photos and videos won’t show up in public hashtag or location searches, but remember to check on other networks you’ve connected Instagram to, like Facebook—there’s no point setting your posts to private if they’re going to be made public on a different connected network. Follower requests can be approved or denied from the Activity tab in the app. Assuming none of your approved followers are ever going to leak any of your private posts, hiding your profile like this on Twitter and Instagram should effectively lock the rest of the world out. The framework of your profile itself, together with your avatar and bio, can still be seen by anyone though—if you really don’t want to be found, here’s some more advice.